It may not be the first pink Lamborghini in the world, but it’s almost certainly the fastest. At the Pikes Peak Airstrip Attack racing event in Colorado, Maude Bouladier set a half-mile women’s speed record (yes, we’ve never heard of that either), clocking a speed of 210 mph in her pink Lamborghini Huracan. 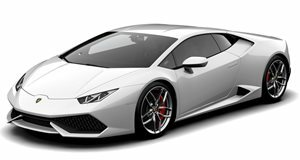 While the stock Huracan is capable of a respectable 201 mph top speed, this particular example has an estimated 2,000 horsepower thanks to a twin-turbo aftermarket package by Heffner Performance. The car is part of Quebec’s OB Prestige Auto Racing Team, who’s racing driver had earlier made a 214-mph pass. Bouladier may not be a bona fide racing driver, but she clearly has some skills behind the wheel. It’s no mean feat to manage that much power, and after getting a feel for the car while riding shotgun, the fearless lady took charge of the Lambo and joined the double century club on her first attempt. While this isn’t the most impressive thing a woman driver has ever done, at the end of the day it’s a hot blonde in a pink supercar going bloody fast. Hopefully she will act as inspiration for more woman to enter the male-dominated world of motorsports.